The USS MISSISSINEWA (AO-144), a Neosho-class oiler, was commissioned on 18 JAN 1955. Built by New York Shipbuilding Corp. of Camden, New Jersey, USS MISSISSINEWA took up station at Newport, Rhode Island and served with the Atlantic Fleet after commissioning. In 1956 she shifted homeport to Naples Italy and for the next eight years refueled the US Navy ships in the Mediterranean Sea. Returning to Newport, RI in 1964, she resumed the standard routine of an Atlantic Fleet "Oiler"; fleet support along the East Coast, training and maintenance in preparation for deployment and "MED" cruises on a regular basis. USS MISSISSINEWA served her country for 21 years, 9 months and 28 days, until decommissioned on 15 NOV 1976. 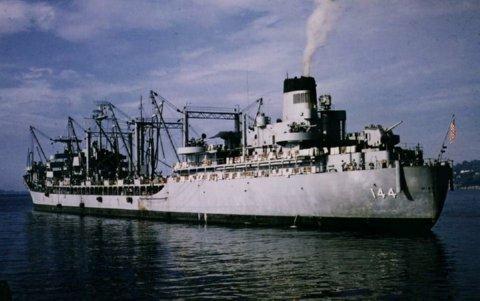 USS MISSISSINEWA was transferred to the Military Sealift Command as T-AO-144 after her decommissioning and continued to fuel the fleet with a civilian crew until 1991. The hulk of the MISSISSINEWA was scrapped in 2007. JAN 1960 - JUL 1960 Returned to U.S for new outfitting. OCT 1964 - FEB 1965 Yard overhaul at Boston Naval Shipyard Charlestown Mass. FEB 1966 - DEC 1966 Newport R.I. The second Mississinewa (AO‑144) was laid down by New York Shipbuilding Corp., Camden, N.J., in May 1953; launched 12 June 1954; sponsored by Mrs. Jerauld Wright; and commissioned 18 January 1955, Capt. M. J. Jensen in command. Mississinewa, second of a class designed to provide fuel, food, stores, and mail services rapidly and for sustained periods to ships at sea, operated primarily along the east coast, with one brief Mediterranean deployment, until 1 May 1956. She then departed her original home port, Newport, for Naples, Italy. With Naples as her home port, the tanker cruised the Mediterranean servicing the 6th Fleet in normal and crisis operations until 1964. During the fall of 1956 and early winter 1957, she supported 6th Fleet ships as they stood by in case they were called on to intervene in the Suez war and the tense period that followed. Again, in mid‑July 1958, she got underway on short notice to provide logistic support to ships of the 6th Fleet during an emergency in the Middle East, this time in Lebanon. Remaining off the Lebanese coast until September, she refueled over 200 ships as the fleet landed marines and then stood by at the request of President Chamoun of Lebanon. From 1962 to 1964, Mississinewa's responsibilities were increased as she served as flagship of Commander Service Force, 6th Fleet. In that capacity she assumed a larger portion of the implementation of the policy, proven wise in preceding years, of maintaining ships of the 6th Fleet independent of bases on European soil. Prior to the reassignment of Newport as her home port in September 1964, Mississinewa had returned to the United States only for regularly scheduled yard periods. During those intervals she received new equipment during overhaul, which included in 1957 the installation of a helipad and the assignment of a helicopter for use in vertical replenishment. Since 1964, into 1969, she has operated in the western Atlantic, from Newfoundland to the Caribbean, with regular deployments to the Mediterranean and one, in August 1966, to northern Norway for NATO exercises.